1. the multilplier was nulled for least distortion. this gives a +/-0.02% error across that 8V CV range in the middle. the upper end is emitter resistance error, which can be further nulled with the HF tracking native to the chip. 2. i didnt use the HF tracking as i was curious as to how good the internal transistors were. they seem equivalent to the PMP4201 and THAT300 transistors. 3. i ran the reference current at 5uA, as compared to the suggested 10uA, in order to keep the graphs consistent with my other work. 4. i used a polycarbonate capacitor, which had a fair bit of drift. i measured the capacitance drift and adjusted the error for it. 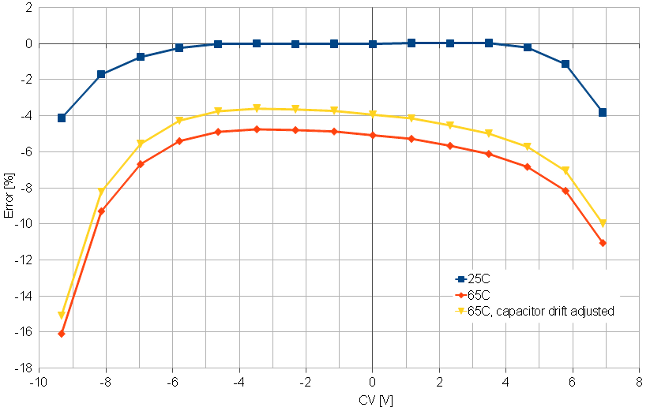 i verified this with a C0G MLCC capacitor that has 30ppm drift, and it gave similar results to the yellow line. i am not showing the MLCC graph, as it has quite a bit of curvature to it, due to the capacitor. i need to think about that curvature a bit, id like to understand better why it happens. overall, the multiplier and exponentiator seem pretty good. i spent a bunch of time probing the chip to figure out the multiplier topology, and it seems to be of the log-antilog variety, rather than the gilbert cell or compensated OTA versions. i dont know how the thermal voltage generator is setup, or the reference for the bias current to the multiplier, but i will say that the latter isnt very good. right now i am trying to figure out where the error is coming from, and how to fix it. putting a regulated -5V on Vee helps a lot, and using a current source for the reference current also helps a bit. the error is assuredly in the multiplier section someplace, and i am suspecting leakage currents, for which there isnt any fix (or at least not one that doesnt require temperature calibration). if the thermal voltage generator was causing the error, i would expect to see a slope error and not an offset error, as is shown. at any rate, thats about all i have for now. ill post more later, including a comparison to an old version of the CEM3340. i do not know how they generate Vt or the 3V, but i do know that these are compensated for Vbe drifts with temperature. they are not, however, compensated for Vbe changes with current draw, or beta change with temperature. it is this latter part that that i believe is causing the issues, and why it doesnt appear as a scale shift. both Ib and It change slightly as beta is modulated with temperature. since they both move by an equal percentage (and both equally affect the scale value), they cancel each other, with only a net offset error, not scale error. i couldnt get the linearity as flat as the new one, and the temperature drift is about the same. i didnt run it as hot, only 55C, whereas the new one was run to 65C (i was being cautious with it), so the drift isnt as much, but proportionally its the same. im still not much closer to solving the drift issue. did discover that the It and Ib current ports are not very well Vbe compensated for temperature, but i think this is part of the overall compensation scheme in some way, as they cancel each other. When I bought a bunch of these, I had someone warn me that the assumption behind the chip has always been that the CEM3340 will be digitally controlled with tuning tables and what-not. Are you using the data sheet schematic? I'm glad you did the comparison with the original, I was wondering about that! I'm assuming that sonically they are the same, or close enough to not worry about it? I think that you are expecting too much from this IC. It was only ever a more reliable product than SSM and that's relative. Neither were truly temperature stable and you only have to play a vintage polysynth while it is warming up, before hitting the Tune button, to know that. They were used in monosynths like the Pro One without correction and were OK as long as you never played it with anything else. Don't think that you can build VCOs distributed over a modular with no tuning control without differential drifts. Both Ron Dow and Doug Curtis were limited by the budget fabrication processes they used and the only thing to be learned from analysing their designs is how clever they were in achieving a lot with one hand tied behind their backs. yes, for the most part. ive been changing a few parts here and there to see what effect they have. as best as i can tell they are the same, but i havent dug too deeply into it. I think that you are expecting too much from this IC. i see your point. i will say, though, that the drift error is mostly an offset error, and not a scale error, which is a much nicer way to fail. I have an OBX which has discrete VCOs. All of these polysynths have been restored with new trimpots and caps. My Memorymoog has many interconnects replaced with ones with gold plated contacts, a practice I carried over from my work in military electronics. The original tin plated interconnects oxidized on the contact surfaces and caused voltage loss with critical CVs; they ultimately oxidized beyond repair. During a session I almost NEVER hit autotune on the discrete OBX. On the 3340-based polysynths I have to autotune at least once an hour. The patent is interesting reading (4,004,141). While the 3340's biggest asset was the (near) elimination of the $$$ tempco resistor, the onboard temperature compensation wasn't complete. It only compensated for bulk saturation Is of the collector current transfer function and not the -0.33%/degCentigrade effect of the KT/q coefficient. In fact the patent mentions using an external tempco!!! yeah, the patent doesnt mention Vt compensation, but the CEM3340 assuredly has a Vt generator that it multiplies with the input signal. i think i have a pretty good handle on the errors in it now, and am working on circuits to compensate them. there is a slight offset voltage error on the I_t generator, which can be nulled out, and there is temperature dependent drift on the I_b generator, which can also be nulled out using the Vt generator. these are half of the problem. the other half is beta increasing with temperature, which can also be nulled out as it is pretty linear, and we have a Vt generator onboard. that should get the exponentiator within reason. most of these probably arent worth worrying about, but the comparison threshold drift is an easy fix - just place a voltage reference at the soft sync input. it can be run through an opamp to still allow soft syncing. Do you guys have Doug's AES preprint and his journal article? If you don't, I will email them to you. They will give you more insight into his thinking. I have a Prophet 5 vers3 which does one autotune on power up, half an hour later in needs another and then maybe another after 2-3 hours then it stays there. Obviously it is warming up inside to the temperature it was calibrated at, the hot PSU ensures that is always above ambient so that's a feature not a design fault. I have had two 3340s fail in the last 10 years, but no other IC failures. So not a very robust IC. Autotune only effects the keyboard notes through a lookup table, all other modulation is added in with that so you need the VCOs to be in the right ballpark otherwise pitchbend will sound awful. The 3340 temperature compensation is just about good enough for that. I added a 3340 VCO board to an ARP Axxe once and there was no way it would track the original VCO. Yes, but it's not describing a VCO. That's the VCA patent. Do you guys have Doug's AES preprint and his journal article? What's the journal number? Again, IIRC, he did an article on his VCA, not the VCO. The VCA got eclipsed by David Blackmer's. well, i built some compensating circuitry, and got it under control, but i cant say its worth it. the process is quite involved. i will think for a bit if there is an easier way, but if i cant find one, i think i will move on. there are 2 currents which need to be adjusted for 3 different parameters (distortion, I_t offset, and I_b drift), and they all interact. A bit of topic, but can you tell me where you got the new CEM3340? i sent an email to curtis electronics some months ago but no repply. sorry, got them from a friend. he mentioned he just bought them off their website, but i couldnt find any purchase links, so im not sure. I was able to order them directly from Susan at onChip, although I ordered them in a large quantity (I think I bought 30) If you're unable to reach them I can probably sell you a couple. They're available in small quantities, I bought 3 from OnChip. there are people selling them on ebay for £30 for one and people are buying them. Had zero CEM3340 failures since I bought my Memorymoog in 1986. Have yet to lose ANY CEM3340s. The patent is describing a multiplier circuit with tempco that is beneficial for a VCO. The human ear is less sensitive to volume changes thus tempco in a VCA would be overkill. If it were solely for the VCA then the emphasis on the design would be for low distortion and noise, not temperature compensation. Doug's VCA paper is this one: JAES Volume 24 Issue 2 pp. 93-102; March 1976. I haven't found any AES papers written by Doug to do with VCOs though. 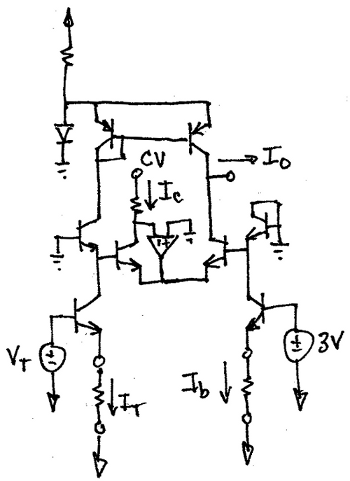 The patent is describing a multiplier circuit with tempco that is beneficial for a VCO. only refers to the linear input. 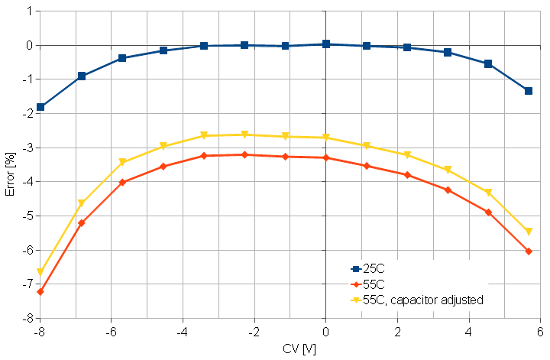 With the use of the above temperature compensation techniques, the only temperature effect on gain is the -0.33% of the coefficient h. This final temperature effect may be reduced by the use of resistors with an opposite temperature coefficient. If it were solely for the VCA then the emphasis on the design would be for low distortion and noise, not temperature compensation. All multipliers require temperature compensation. The Gilbert cell is more elegant. Not a VCO. You need a linear multiplier to increase the CV by PTAT, not an exponential amplifier that decreases it by PTAT and requires a TCR that you are trying to eliminate. Where he discusses low distortion and noise.